Scrangie: Loose Ends and fun stuff. And yes, now that I'm seeing them again and not basing it only on memory, they totally are matches to the new Sally Hansens. Thank you to Krisprimps for refreshing my memory as well! This is OPI Pink Me I'm Good from Valentine's day at Ulta. Not the best picture of it because it only shows the gold side of the glitter. It does a little green duochrome too, but it's subtle. One of the very few pinks I like to wear. OPI Bling Dynasty from the Hong Kong collection. I didn't have a bottle of this at the time I did my post and I was going to go back and post this picture with the review, but it took me longer than I hoped it would take to get an acceptable picture of this. That was a bit of a drag, now I want to post something fun. 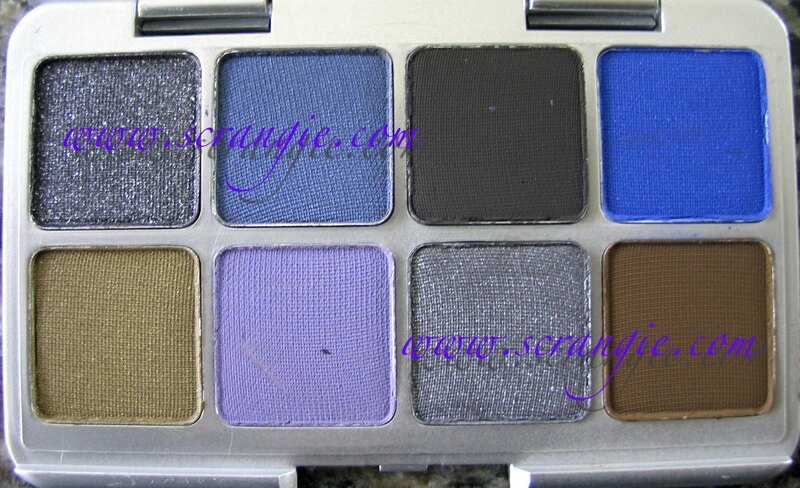 I got this Cargo Wet/Dry eyelining palette on clearance at Sephora a little while ago and I love it! I was very shocked by the size of it- it's as small as a credit card!- but apparently it doesn't need to be any bigger cause I've used it a ton and haven't even put a dent in it yet. I've only used the black, sparkly black and sparkly grey ones so far, but I think they're really nice. I use a drop of MAC water based mixing medium and a very short bristled stiff angled brush and the line comes out perfect. I used to use a cake eyeliner years and years ago and this reminds me of the one I used to use. I haven't tried them as eyeshadows. I don't know how well that light purple (yeah... two of those are purple, blame my camera!) would work as a liner though.... I haven't done a look yet that needed a light purple eyeliner so it remains untried. Sally Hansen Hard As Nails Malachite Pearl. I don't think I even need to say anything about this. I think words would ruin it. Shhhh. Just gaze upon the beauty and let it speak to you. Revlon Street Wear Burnt. This is the grey-green version. This is one of those Streetwears that has multiple versions all under the same name. I don't know why companies don't just use different names. I was at Sally last week getting some new Finger Paints and noticed that China Glaze Flying Dragon is a totally different color than it was when I first bought mine... Bizarre.... why not just name it... uh... Walking Dragon? Swimming Dragon. Cause it's not the same color anymore. Oh well. I love this polish. Why did Revlon ever stop making these?! Now their polish line is super boring. I wish they'd bring these back, or at least re-create some of the colors. But hey, now i got interested in what you said about Flying Dragon! How did it look like now? Andrea, remember how it used to be a 'dark' purple neon? It dried pretty deep but it was still neon purple? Now it's a neon light purple, or really a neon fuchsia like Essie Bermuda Shorts! The glitter seemed different too but I didn't take a close enough look at it. Skulda, isn't it?? I can't stop staring at it! 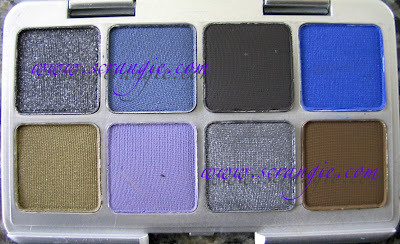 love the swatches- is the bourjois one labeled with the number 24(on the back, encircled? do you think it has got a similarity with opi's baby it's coal outside? AmusedPolish, Ah! Yes, it does! Number 24! But I don't think it looks like Baby It's Coal Outside at all. Well... I guess they're both dark and shimmery, but the OPI is grey and this is green/charcoal/purple duochromey. Blackbird Feathers, that's a great description and creates a whole new lemming for me. I can totally visualize that! The dupes are cool with me since I don't care much for OPI...didn't like SH until lately. Yay, random swatches! I love when you post on the things that you enjoy, so this post is much appreciated! This post was great, I agree with you about the "name/color changes"..is it really that hard to re-name the polishes? or rather they could have "Flying Dragon", and then "Flying Dragon II"
That Pink OPI is very pretty!, and the green Sally Hansen has me drooling! Hi girl love you blog, Just FYI I nominated you for an award!!! Dude, I have Malachite Pearl too! LOVE LOVE LOVE. Haha awesome about those new SH's. Now I don't need them because I already have the $OPI's. Your description of the Bourjois nail polish made an instant lemming in me and I tracked one down and bought it. :) Thanks so much! Love love love just a fairy tail. But I hate the brushes on that brand, so thin! Malachite Pearl looks like an enchanted forest. Ah Streetwear...I still have some things from that line. I would like to encourage you to post pics of any nail polish you choose to! If someone wants to find the color bad enough they can track it down and really that is part of the fun sometimes! Yes, their Streetwear stuff was awesome! So glad you like the Bourjois. It looks awesome on you, like I knew it would! Apparently it is called Black Carbon, but why you have to look the names up elsewhere rather than having them on the bottle somewhere is beyond me. I had (still have in one of my Caboodles..) the Revlon Street Wear in Grass Stain. I loved it! But it NEVER DRIED! ugh i'm so jealous. i've searched high and low for that bourjois! i swear all uk drugstores are hiding it to piss me off! Oh my... I am in LOVE with that Revlon polish! It's near impossible to track it down though :( Do you know of a possible dupe for Burnt?? We all need to write to Revlon and tell them to stop being obstinate and bring back the Street Wears! Love, love, love the colors! Unusual. Fabulous! Wake up Revlon- HUGE market here! Street Wear was SO much better than the boring stuff you try to foist upon us now! The Burnt looks great on you.